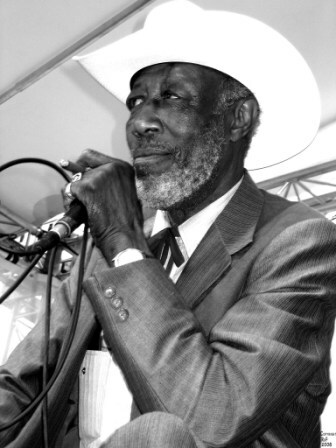 One of the great personalities of Chicago blues is the unstoppable Tail Dragger, whose charisma fills up any room he plays in. 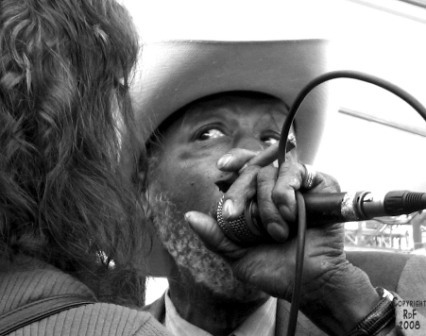 Though considered to be a Howlin’ Wolf stylist, Tail Dragger puts his own touch to the proceedings. 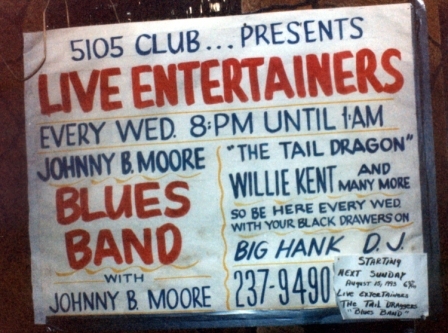 A regular performer on the West Side of Chicago, Tail Dragger’s band has provided work for many great artists, including Eddie Taylor, Jimmy Dawkins, Hubert Sumlin, James Scott, Willie Kent, Tim Taylor, Larry Taylor, Martin Lange, Rockin’ Johnny, Robert Plunkett, Illinois Slim, Scott Dirks, Dave Waldman, and many others. Bob Corritore had the privilege of working with Tail Dragger in the late 1970s and early 1980s. Enjoy these photos of the great Tail Dragger. Left to right: Big Leon Brooks, Paul Cooper, Willie Williams (drums), Tail Dragger (in overalls), Sylvia Embry. Photo courtesy Paul Cooper. Willie Williams, Paul Cooper, Tail Dragger (seated), Sylvia Embry, Big Leon Brooks. Photo courtesy Paul Cooper. At the Delta Fish Market, summer 1983 with Hester Brooks (widow of Big Leon Brooks), Bob Corritore, Illinois Slim, Tail Dragger, and Hubert Sumlin’s daughter. Tail Dragger. Photo André Hobus Library courtesy Marc de Jonghe. Tail Dragger’s out of focus Leric Records publicity photo from the 1980s! Tail Dragger holding a live fish at the Delta Fish Market. 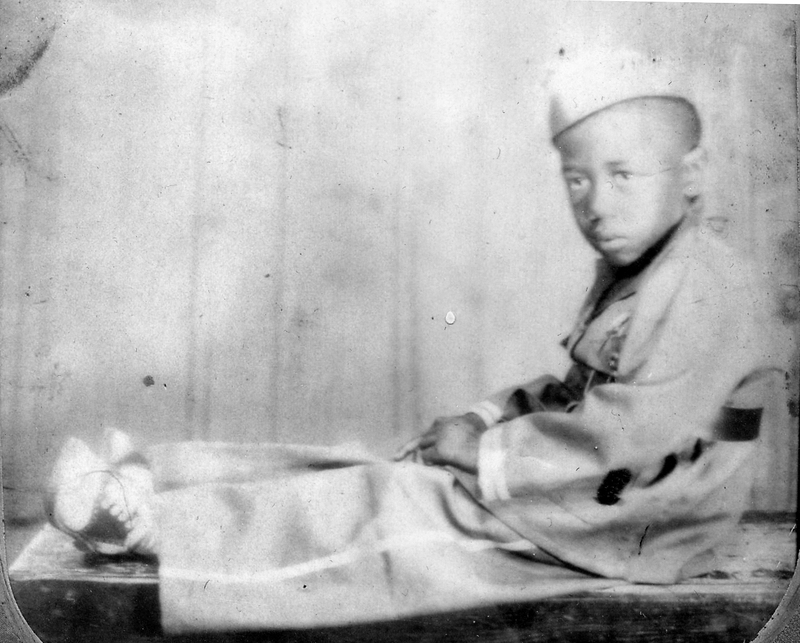 Photo Erik Lindahl. Tail Dragger with Martin Lang and Rockin’ Johnny. Photo by Fredrik Gustafson. Bob Corritore and Tail Dragger backstage at the 2011 Chicago Blues Festival. Photo by Daniel Swadener. Tail Dragger at Chicago Blues Festival. Photo by Jennifer Noble. Tail Dragger and Bob Corritore in Helsinki, Finland 2012 by Pertti Nurmi. The 2012 Lucerne Blues Festival Calendar by photographer Thomas Torkler featured Tail Dragger and Bob Corritore on the cover. Tail Dragger in Boquete, Panama, 2013. Photo by Bob Corritore. Bob Corritore and Tail Dragger at the 2013 Boquete Blues & Jazz Festival, Boquete, Panama. Bob Corritore, Henry Gray, Tail Dragger backstage before their show at the Pocas Y Jazz Festival, Pocas de Caldes, Brazil. Tail Dragger and Bob Corritore at Stadsschouwburg Theatre, Bruges, Belgium, 2013. Photo by Franky Bruneel. Tail Dragger’s first records on Jimmy Dawkins’ Leric Records. Here is Jimmy Dawkins’ note that came with the record. On the other side of the above note is Tail Dragger’s bio, complete with handwritten corrections from Jimmy Dawkins. Tail Dragger at Tempest Recording in 2015. Photo Drew Verbis. Eddie Taylor Jr., Henry Gray (seated), Bob Corritore, Tail Dragger (seated), Rockin’ Johnny, Illinois Slim, Bob Stroger (seated), Brian Fahey. Photo by Drew Verbis. Tail Dragger crawling on the floor at the Rhythm Room! Photo by Marilyn Stringer. Bob Corritore, Tail Dragger, Rockin’ Johnny, Illinois Slim, 2016 Chicago Blues Festival. Willie Buck, Bob Corritore, Tail Dragger outside of Jazz Record Mart, Chicago. Tail Dragger, Bob Corritore, Henry Gray in Pocos de Caldas, Brazil. Tail Dragger, Valerie June, Bob Corritore, Kirk Fletcher at 2011 BMAs, Memphis, TN.